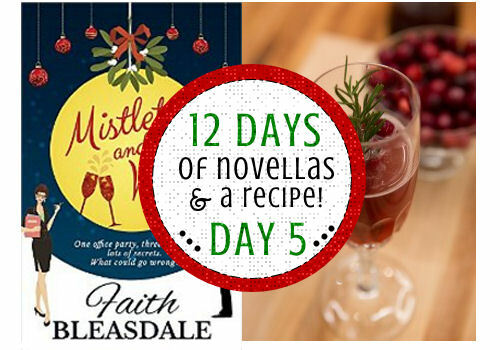 12 Days of Novellas – Day 5: Mistletoe and Wine by Faith Bleasdale: Review + Recipe! On the 5th day of Novella's my blogger gave to meee..
Mistletoe and Wine and a Prosecco Fizz made with cran-berry. Join me today as I review Mistletoe and Wine by Faith Bleasdale. This entry was posted in 12 Days of Novellas, Book Reviews, Kindle Downloads, Seasonal: Winter and tagged Chick Lit, christmas cocktail recipes, christmas cozy mysteries, christmas kindle downloads, Faith Bleasdale, good christmas mysteries, mistletoe and wine, mistletoe and wine download, mistletoe and wine review, Novellas.